By Sam Zacher / Jan. 31, 2016, 2:59 p.m. Climate change is one of the most complex issues that humanity has ever faced. There are psychological, economic, political, ethical, and other social reasons why we, as a human race, haven’t been able to produce effective solutions to the problem, and it can be quite difficult to fully understand the catastrophe in its entirety. The nature of climate change as an “issue” is rather unique. First, it is a monumental collective action problem, in which individual actions (the consumption of fossil fuels) worsen the problem for all, but those individuals are economically incentivized to pollute because their perceived benefit is greater than the cost of changing their behavior. Second, mitigating the effects of climate change will require people to absorb costs in changing our methods of energy production and consumption. Third, it’s an extremely partisan issue. Fourth and finally, in a lot of ways, citizens don’t care about climate change, somewhat justifiably, as it doesn’t affect everyday decisions like the economy does. A challenge on this scale requires new laws. That job falls on the United States Congress—which, in this case, is an extremely ineffective government body to produce solutions for this complex problem. First, members of Congress (MCs) are incentivized to provide short term solutions. Citizens hold the keys to an MC’s ability to stay in power. While in office, MCs must make the lives of their constituents better so that, when up for re-election (every two or six years), those constituents have reasons to vote for that politician again. In his 1974 book, Congress: The Electoral Connection, David Mayhew argues that politicians are incentivized by one thing: re-election. Since people are generally short-sighted, these benefits will often come tangibly, in “economic” forms. In the case of climate change, for the most part, mitigation policies will require short-term financial costs for people. So MCs naturally lean toward keeping energy prices low, which requires relying on traditional fossil fuel sources and does not mitigate the effects of climate change. Second, MCs are incentivized to prioritize the interests of their discrete districts or states, not the good of the entire country. Representatives in the House serve districts; senators serve states. They both only represent particular geographic locales of the United States, places that often have quite different preferences. There are “coal states” like Kentucky and “oil states” like Oklahoma, which naturally elect politicians who want to protect protect their interests. In the case of climate change, some states have strong fossil fuel interests, and others are theoretically more interested in preventing worse droughts (California) or sea level rise (Florida and New York). However, those preferences are often less significant and immediate, unlike relations with Big Oil or Big Coal in centers of fossil fuel extraction—especially when the costs of preventing climate change are felt immediately, while the benefits are felt over the long term. The varying, often contrasting preferences of MCs don’t do anything to mitigate the complex collective action problem of passing environmental regulations. Third, the paralysis of a polarized Congress bodes poorly for all issues, but especially one like climate change that requires timely solutions. Today, to guess someone’s beliefs about climate change, virtually all you need to know is his or her political party preference. The United States has become ideologically polarized on many issues for various reasons, including the ideological homogeneity of the South, new communication technologies and choices in residential locations, and the polarization and specialization of the political media. It’s hard to find a more polarized issue than climate change, in the public and in Congress. However, it’s also hard to find a more time-sensitive issue than climate change. Unfortunately for the earth and its people, climate change won’t wait for the gridlocked Congress to sort out its differences. Because polarization prevents legislation from passing, we’re more likely to continue to burn fossil fuels and worsen the state of the atmosphere than to work to produce necessary solutions when stricken by such ideological division. Fourth, citizens vote on politicians for their decision-making abilities on a whole array of issues, and because people don’t prioritize climate change, electoral accountability on this particular issue falls by the wayside. As mentioned previously, people generally don’t prioritize climate change (the causes of which will be addressed in a future article). In a 2014 study, Gallup found that just 24 percent of respondents said they worry about climate change a “great deal,” compared with 59 percent for the economy, 49 percent for unemployment, and 39 percent for future terrorist attacks. Climate change ranked fourteenth out of fifteen issues listed (race relations was fifteenth). It’s not expected that citizens would worry about climate change more than the economy, but the numbers suggest that Americans rarely vote for candidates with this issue primarily in mind. 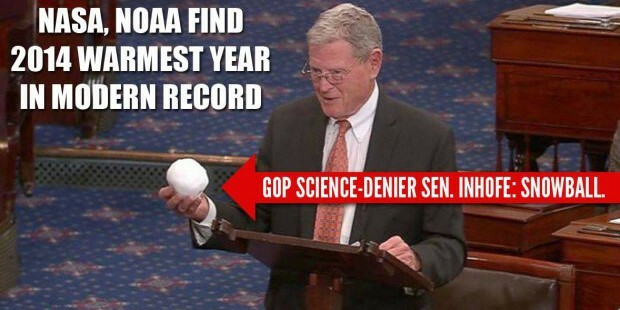 As a result, some politicians do not prioritize the issue, and others, like Senator Jim Inhofe (R-OK) and Representative Dana Rohrabacher (R-CA), have gone so far as to declare climate change a “hoax” or “fraud.” This is a clear lack of accountability in making politicians listen to the scientific expertise necessary to solve this problem. Now, these four major barriers to climate change solutions exist because of the institutional design of the United States Congress, but they are certainly not the only cause of legislative inaction on climate change. To put it crudely, people simply don’t take the issue seriously. The structure of Congress allows that apathy to prevent action on climate change, which further perpetuates our ability to disregard climate change as an issue that needs to be addressed immediately. These aforementioned barriers are consequences of the cornerstones of our democratic republic: representation and elections. Some structural reform solutions to these issues might include lengthening congressional terms, giving more power to another branch of government when polarization causes congressional gridlock, or even a legislative “clock” on time-sensitive issues like climate change, at which point the government powers may shift. “Solutions” like these aren’t the most feasible and they may cause unintended negative consequences for overall governance. However, it’s important to understand the structural barriers preventing important legislation in creating the whole picture of legislative inaction on the issue, as they’re just one current of the stream that flows in the direction of anthropogenic climate change, the flow against which we’re fighting to develop responsible, necessary solutions to this crisis. The image featured in this article was posted by Josh Kilburn. The original image can be found here.